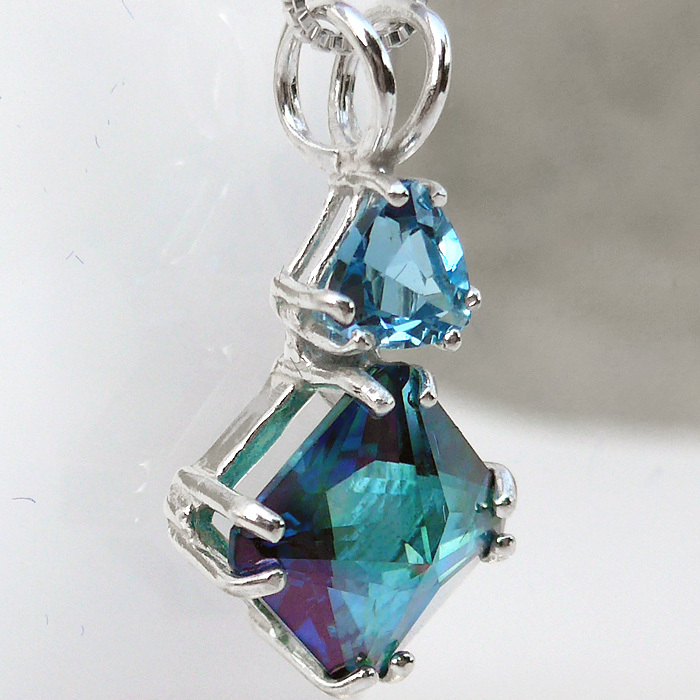 This beautiful iridescent 1 inch high Aqua Aura quartz Mini Magician Stone crystal pendant is crowned with a large, vibrant violet pear shaped Blue Topaz gemstone of exceptional quality, both in the style of the stone and in the simple silver band setting which allows the stone to breathe and function at its highest vibration. This pendant comes with a simple sterling silver chain which will sit upon the thymus, between the throat and heart chakras, where it will be of most beneficial resonance. The combination of Blue Topaz and Aqua Aura Quartz energizes the throat, third eye and crown chakras, increasing our access to inner spiritual guidance, providing support for deep meditation practices, stilling the mind, and enhancing our ability to speak our own truth based upon our own direct experience of subtle energies in the world around us. Aqua Aura Quartz is a form of laboratory enhanced quartz crystal with interesting metaphysical properties and unique mineralogical characteristics. Modern alchemists heat quartz crystal in a vacuum chamber to 1600° Fahrenheit, and infuse the chamber with gold vapour, which adheres to the surface of the crystal, imparting a pronounced metallic iridescence and a deep aquamarine coloration with flashes of deep purple. 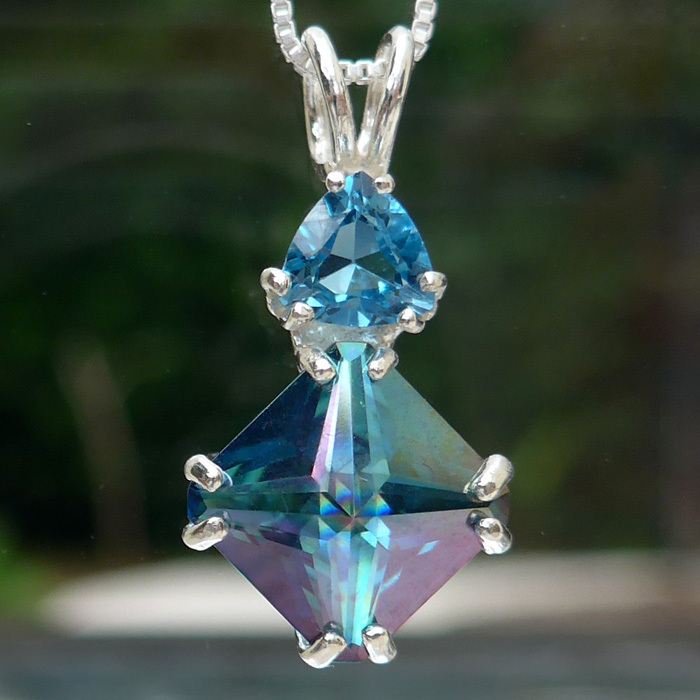 Aqua Aura Quartz resonates with the energy of the throat chakra, which is colored blue or aquamarine in the Western chakra system, and also energizes the indigo colored third eye chakra, while connecting throat and third eye to the crown chakra, which is considered to have a gold or white coloration. Aqua Aura Quartz helps us to access inner spiritual guidance (crown chakra) and speak our own truth (throat chakra), and also stimulates the third eye chakra, helping us to access information in the Akashic records and to perceive subtle energies in our environment. Blue Topaz is a rare find indeed, and resonates with the energy of the throat chakra, which is associated with the color blue in the Western chakra system. Blue Topaz assists us in speaking our own truth, in a way that is easily understood by othrs, and thus is indicated for those working in theater, electronic media, and other activities requiring good communications skills. Blue Topaz also helps us to manifest our own inner truth, our Higher Purpose, all those goals and desires which align with our own best and highest good and which promote the achivement of the best and highest good of all those with whom we are connected in this life. The energy of Blue Topaz is tremendously supportive of deep meditation in which the egoistic personality is uplifted to the Higher Realms where Higher Mind and Cosmic Consciousness reside. 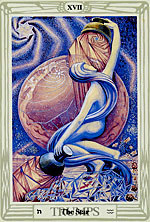 In meditation with Blue Topaz, Jane and I connected directly with the energy of the Great Mother in her aspect as the Goddess of the Starry Night Sky, depicted by Tarot Trump #17, The Star. Jane and I felt a tremendous sense of relaxation within the body, and an an emotional releasing which loosened the grip of various negative emotions with which we were struggling prior to the meditation session with Blue Topaz. The relaxation of physical and emotional bodies was followed by a sense of mental ascension, a strong feeling of connecting to realms of Universal consciousness often depicted in art and mysticism by pictures of the starry night sky. 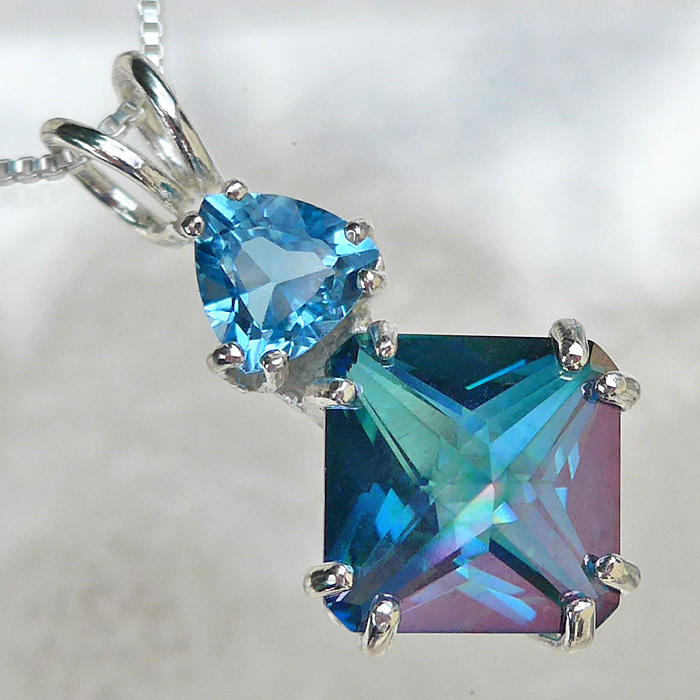 Best of all, Blue Topaz can help us access the feeling of being filled with the energy of the Star Goddess, which is electric, cool, heating, and soothing. Mental activity resolves into Silence and a felt sense of the peace which passeth understanding. Note: Weight above is shipping weight. Average Net weight of this pendant is 4.862 grams not including the chain. Each piece is unique and may vary slightly in appearance. Each pendant is beautiful and guaranteed to meet with your complete satisfaction!